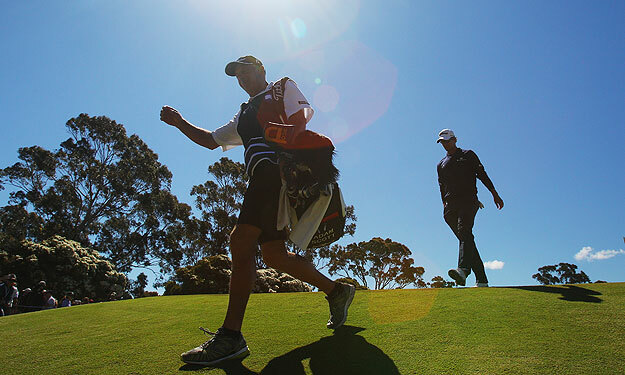 Steve Williams says this will be his last year as a full-time caddie. It was a rainy night in Augusta, Ga., and Steve Williams was driving back to the house he’d rented for the week. Adam Scott had just won the Masters and was still celebrating at the golf course. Somewhere in between the heavy raindrops that splashed outside and talking to his wife back in New Zealand, Williams thought to himself, “This is it.” The nearly 50-year-old caddie who had been on the winning bag for 14 major championships, never mind countless other victories and a few Hall-of-Fame careers, was finished. There was nothing left to accomplish. In his mind, he was already on a plane to his native Aotearoa, ready to never be seen carrying another bag again. For nearly four decades, Williams has had the good fortune of standing alongside legends -- Greg Norman, Raymond Floyd, Tiger Woods and most recently Adam Scott. Talk about right place, right time. But when it comes to caddying -- an increasingly important role with more to it than simply showing up, keeping up and shutting up -- Williams is also quite simply the best in the business. As he prepares for his final season as Adam Scott’s full-time caddie, he is completely relaxed and at peace. It’s far from a brutish persona that has sometimes been associated with Williams. The setting for our interview is a table in the back at Fandangles Restaurant & Martini Bar, a downtown Atlanta hotspot inside the Sheraton hotel featuring American cuisine in an eclectic surrounding. We dine on salad and steak and Williams shows a particular liking for Shandys (beer with a splash of lemon-lime soda). He is as forthcoming as he has ever been, opening up about nearly walking away from the game last April, what he says really happened between he and Tiger Woods and the one regret he has in his career. I think I read somewhere that you started caddying at age 6. But your first real gig was as a 13-year-old for Peter Thomson. How did that come about and what about caddying appealed to you? I was a scratch handicap at age 13 but was also a rugby fanatic. Well, every kid in New Zealand wants to be an All Black, and I was progressing as a rugby player. But caddying, I was so intrigued by it. My dad was a top amateur player and he’d met Peter at a tournament in New Zealand, so he arranged for it. That just chucked rugby and playing golf right out the window. Peter was a five-time British Open champ, he’d won the New Zealand Open nine times. I just loved it from Day One. Right there and then I knew that’s what I want to do for a living. So much so that you left home in 1979 to caddie professionally in Europe by the time you were 16 years old. Was that scary? How much money did you have in your pocket? As a child my father instilled in me that you’ve got to work hard. I had like $20,000 in the bank by the time I was 13. I had caddied every weekend, had a job in a butcher shop, had a newspaper route, I picked tomatoes. I’m guilty of not going to school, but I’d do anything to make a dollar. Even though I didn’t have my parents’ OK to go caddie, I had my own money so I just left at age 15, which is when you were legally allowed to leave school. But my mom, even to this day I think, if she had one disappointment in me as a son it’s that I did that against their wish. And as intimidating as it was to go to London, coming from a little town in New Zealand, it wasn’t as daunting as it seems. I just got to the course and got a job and got on with it. Who was the first player you caddied for when you got to Europe? I just showed up in the parking lot at a tournament in Leeds and the first player who hired me was an Aussie, Noel Ratcliffe. I caddied for him for a couple of weeks then was on (former Ryder Cup player) Mark King’s bag for a little bit. I progressed from there. I was with Ian Baker-Finch for a little bit and it was through him that I started caddying for Greg Norman. How did the introduction to Norman come about? I’d caddied in Australia for Ian in 1982, and he played with Greg in a couple of tournaments. When you’re out with someone like Greg -- not to say you’re looking for a job -- you make sure you do everything properly. You want to look professional. Over the Christmas holidays I got a call from Greg and he said, ‘Would you like to come caddie for me at the start of the year?’ That was an awesome call to get. You caddied for Norman full-time from 1982 until 1989. What was the best moment you had on his bag? He won a lot of tournaments but the best moment was the very first win I had with him. It was at the Australian Masters. Back then, that was a big tournament. He knew I was young. He taught me the ropes. I would’ve never got to where I am today without starting with Greg Norman. He taught me a lot about the game and was a fantastic player to watch. He was so good it was like he was almost teaching me. The two of you became close -- too close by your own admission -- and eventually he fired you. I’d caddied for him in Japan and stayed over there to caddie for someone else the following week. The phone rang in the middle of the night -- how (Greg) found the number was amazing because this was before cell phones and the internet and not many people even knew where I was staying that week. I was disappointed to be told over the phone. I thought that wasn’t the right way to do it. It was the first time I had been fired, but it didn’t unsettle me to be honest. Although I had been caddying for nine or 10 years, I was still doing it for fun. It wasn’t a great living. Some years I would caddie in 48 tournaments. That’s just the way it was back then. There were more players than caddies. As for him finding my number, it turned out he had called the tournament and talked to someone who had just happened to ask me earlier in the week where I was staying. Raymond Floyd then hires you and work for him from 1989 until 1999. How did that compare to working for Greg? It was night and day. Greg was a young guy, in the spotlight, a global superstar, running the high life. Raymond was an older guy, a family guy. He was a different sort of player, too. Greg was bold, Raymond was more strategic. I loved my time with Raymond. He was such a determined person. He just had a great attitude. He and his wife, Maria, treated me like a son. Tiger Woods called to interview you in 1999. Did you have any idea that was coming? I was back in New Zealand and my first tournament that year was going to be at Doral with Raymond. I didn’t even know that (Tiger’s former caddie) Mike “Fluff” Cowan had been let go. I’d also decided that I’d had enough and 2000 was going to be my last year caddying, so when Tiger called me I wasn’t 100 percent sure I was going to take the job. But I flew to Orlando and interviewed with him and he hired me on the spot. Hang on. Tiger had won the Masters in record fashion two years earlier and was already the biggest name in the sport and you weren’t sure you were going to take the job? He’d won the Masters, yes, but you don’t know how you’re going to get on with a guy. Steve Williams said he and Woods jelled so quickly because they are both incredibly competitive. How would you describe your early years with Tiger? It’s an evolving process when you caddie for someone like him who has such high expectations. It was all about winning, so it was important to get to a win under the belt reasonably early and we did. He won in May of that year over in Germany at the European Players Championship, then the Memorial Tournament and at the old Western Open and then the PGA Championship. We jelled pretty quick. Why did you jell so quickly? I’m as competitive as he is. Even caddying you want to do the best you can do and here was a guy who had one thing he wanted to do: Win. We got on good. One of the nicest things I found early on was he always thanked you at the end of the day. My first impression after a few weeks was, ‘This guy’s been brought up well.’ He said please and thanks and those sorts of things. At what point did the relationship change? (Laughing) Any caddie-player relationship -- and probably any relationship in life -- that’s what it’s like: It’s great in the beginning, then you take things for granted. There was a certain personality you had to have working for him, wasn’t there? Sometimes you were criticized for it. It didn’t bother me one bit. I always felt Tiger was entitled to play on a level playing field. I felt I could make difference for him or other players in the group. I understand why I caught a lot of flack, but I only did it for the benefit of him and the players he was playing with. It’s not really my personality to be the enforcer, but it didn’t take long to figure out what Tiger wanted. Was that the most difficult part of that job? Working for Tiger as a caddie, there was nothing difficult about it. For me, it was always difficult working with a lot of people around. I always said to him one day I’m going to caddie with my crash helmet on so I don’t have to listen to everybody. You get this weird sensation when you caddie for him that you want to crawl under a tree because people are always looking at you. It’s a claustrophobic feeling. I felt like that regularly with him, even going out for a practice round half-past six in the morning. Working for him though, he was tremendous to caddie for. He was efficient with his time and got his job done. He never had you waiting. He didn’t play a lot and always practiced early in the morning. I loved that. What was your best moment on Tiger’s bag? When he won the Masters in 2001 to hold all four major championship trophies at once. He’d won the British Open and the U.S. Open and the PGA Championship the previous year. With the PGA in August and the Masters not ‘til April, that was seven months of talk whether he could do it. The chatter went on and on. To do it and accomplish something that is probably never going to be done again was unbelievable. From his perspective, he couldn’t not know that everyone was talking about it -- even as focused as he was. I find it hard to believe a sportsman has played under more personal pressure than he did then. 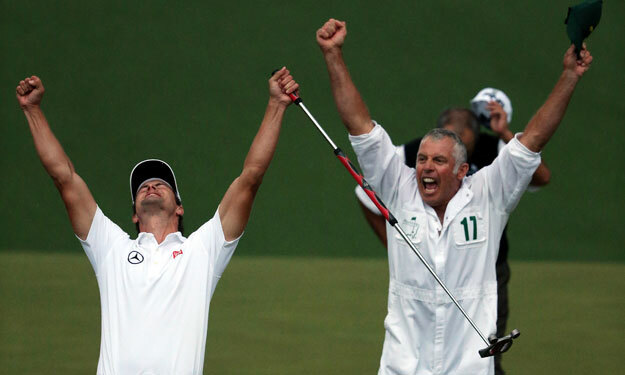 Caddie Steve Williams almost retired after Adam Scott won the Masters in April. Greg Norman, Raymond Floyd, Tiger Woods and Adam Scott, among others. Not bad. What was your single-best moment as a caddie? I’m hard-pressed to go past the 10th hole in the playoff at Augusta National with Adam and Angel Cabrera. Convincing Tiger to hit lob wedge instead of sand wedge on 18 at Torrey Pines in the final round of the 2008 U.S. Open was a big call, but it wasn’t like Tiger was trying to win his first major. Major championships are very hard to win -- Tiger made it look so easy, I don’t think a lot of people outside the game realized what he was doing. It ain’t that easy. No Australian had won at Augusta. When Adam read the putt, I told him his read wasn’t close and it broke a lot more than he thought. I hadn’t seen the putt before but as I walked down the fairway the first thing I said to myself was ‘It’s quicker than you think and breaks more than you think.’ Everything on the other side of that green was slower than you thought, and the same was true with fast putts. He might’ve missed that putt and not gone on to win and then he’s still trying to win his first major. The night Adam Scott won the Masters, you told me 2014 would be your last year full-time. Take me through that evening. After Adam won the Masters, everyone from his team got invited to the club to celebrate. That’s not really my kind of scene, so I was driving back to the house we’d rented for the week. I called my wife, and Greg Norman called me, too. The first thing that crossed my mind after all that was, ‘That was it for me.’ I went to caddie for Adam with the intention that I wanted to get him over the line in a major championship, and it happened. I thought that was the perfect way to end my career. Something tells you that’s the moment; it’s time to do something else. Deep, deep, deep inside me that’s what I wanted to do, was never be seen again caddying. I’d made up my mind and my wife agreed with me. When I talked to all my friends they said I had a lot to offer Adam and they said I couldn’t do that and disappear. But it was a tough decision. So (2014) is my last year caddying full-time. If Adam agrees, and we’ve talked about it, I’ll caddie for him from Doral to the TOUR Championship in 2015 and then that’s it. What’s the biggest difference between caddying for Adam Scott and caddying for Tiger Woods? Adam is not as intense. The fuel burns in every player out here, but what you see from the outside is different from Adam than it is from Tiger. Adam is more relaxed about things, while if it ain’t going Tiger’s way it can be a tough walk some days. Having watched Tiger play at a level that arguably no one has ever played and then to come to Adam, who has a lot of talent, I think Adam is capable of playing at a level even greater than what he’s doing. Working for Tiger has helped me working for Adam, no two ways about it. What’s your biggest regret or mistake as a caddie? In 1990 when Raymond was attempting to become the oldest player to win the Masters, he had a one-shot lead with two holes to go. He drove it right down the middle on 17 -- the green was a different shape then; the pin was in the front right and the green still had a ridge to the left, so if you missed you always missed to the right because it was a simple up-and-down. He told me he was going to aim a little left of the hole and work it back toward the flag. The first thing that went through my head was, ‘What if you pull it left?’ I wanted to tell him to fire straight at it, but he was in complete control of what he was doing. And I didn’t say it. I always say what I think. It was the one time I didn’t. I’ve always regretted that. Sure enough he misses left, three-putts, pars 18 and lost in a playoff. I guess I thought Raymond had so much experience around there. He had an incredible record there. It was our first opportunity to win a major together. But whether I’m right or wrong I always say what I think. That would be the only regret I can honestly say I’ve had. What’s the role of a caddie? What do you say to critics who think you guys are just along for the ride? If caddies are just carrying the bag, then players would just hire a local caddie. Every player requires different things -- the most important role is basically getting your man around the course best you can. You have to have the best understanding of the course all the time so you can try to prevent errors. There are always going to be errors, but caddies can give the right information and prevent a lot of errors. But we all know the player hits the shots. Give me your best caddie story, one that we can print anyway. Twice I’ve gone to the wrong golf course. A couple of years ago when The Barclays was at Plainfield (N.J.) Country Club, for some reason I thought it was at Ridgefield. The pro-am was at 7 a.m., so I turn up at the course around 6 and thought ‘That’s funny, there’s not much going on around here.’ Then I realized I was at the wrong course. Another time, I was caddying for Raymond and we were going over to play in Thailand on a course that Arnold Palmer had just opened. Arnold was flying with us and commented quite a bit about how many snakes were on the course. So we’re on the first hole, I’d taken the flag out and am standing on the back of the green when all of a sudden I hear a hiss, like a king cobra. I absolutely s--- myself. Well, it was the sprinkler head and the water had hit me from behind. I jumped and made an absolute fool of myself. Raymond just rode the piss out of me about that.